and take the kiddos Strawberry Picking. 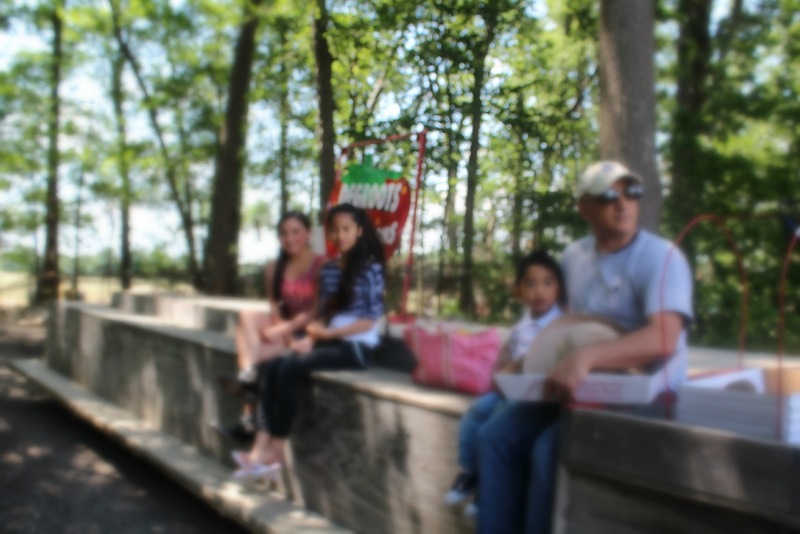 I still remember the first time I went with my family strawberry picking. My grandmother took us to Baguio City up north about 6 hrs. from Manila. Luzon tropical pine forests ecoregion. the Americans developed this city when they took possession of the Philippines in the early 1900's. Driving up there, you'll have to take the famous Zigzag road. zigzaging your way up the mountain with hairpin turns on the steepest portion of Kennon Road. The weather in Baguio is like springtime in the United States. There are some cold days but most days are perfect. So the produce thrives well there. Baguio is famous for its strawberry fields and strawberry jams. So in that very first trip, we all went strawberry picking. is still fresh in my memory . when it gets hot in Manila in the summer, we go up to Baguio to get cooled off. I wanted my children to have that same experience picking strawberries themselves. fairly close to where we live. but they had a thrilling ride on a trailer with bench seating pulled by a tractor. Everyone enjoyed picking, the strawberries are plump, juicy and sweet. We took home about 11 lbs. of strawberries. staring down at this huge box full of strawberries ... thinking what to do with it. isn't it supposed to be Mommy's day-off? Yeah right!!! 24/7 on duty. and the rest, I will make into preserves tomorrow. In this recipe, you can use any of the 2 pie crust recipes written below. In a medium bowl, mix all ingredients together. Transfer to pie dish and press evenly at the bottom and up side of the pie dish. Bake for 10 minutes. Let cool. In a large bowl, sift all dry ingredients together, flour, salt and sugar. Break up vegetable shortening with your hands and start coating it with the flour mixture. Add the butter in, working quickly with your hands, or use a pastry cutter so the butter does not get too soft. Mix it until crumbly. Add the ice water, few drops at a time until you form a dough. Form dough into a ball. Cut in half and slightly flatten into a disk. Wrap in disk in plastic wrap and refrigerate for about 40-45 minutes. On a floured kitchen surface, place dough and roll out into 10-12 inches to fit a 9 inch pie dish. Fold overhang, it should be flush with edge of pie dish. Prick bottom and sides thoroughly with a fork. Bake pie crust at 400° F for 12-15 minutes. 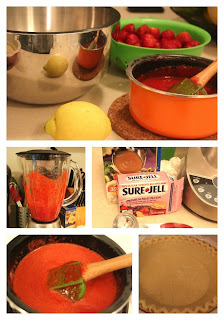 In a blender or food processor, puree about 1 1/2 pint of your strawberries, to make 1 1/2 cups of strawberry puree. In a medium non-stick sauce pan, add sugar, salt, Sure-jell and cornstarch, mix well. Stir in strawberry puree. Turn on stove to medium-high heat, stirring constantly bringing mixture to a boil. About 2-3 minutes or until slightly thickens. In a large bowl, transfer mixture, add lemon juice, blend well. Set aside and let cool. When glaze (mixture) is at room temperature, fold in the rest of the strawberries, coating it well. 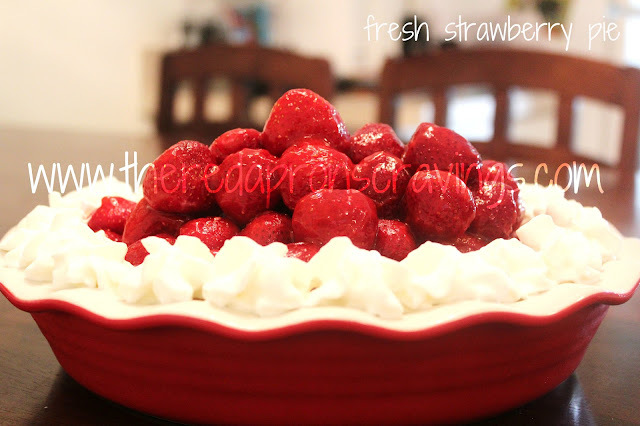 Pour glazed strawberries in pie crust. Refrigerate for about 2 hrs before serving. Top with whipping cream if so desired. Don't overworked your dough otherwise it will get tough. I prefer using a pastry cutter when cutting in butter into flour, the warmth of your hands causes butter to soften, you want your dough crumbly not an oily mess. If you don't like making your own pie crust, you can always use a frozen store bought pie crust. Less work! If you have large strawberries, cut it in half, my kids picked medium size strawberries so I left them whole in this recipe. Especially when it's vine-ripened and freshly pick from the farm. The sweetest and juiciest I've ever picked. Thanks Amanda! I'm glad you visited my blog. Will be working on a Mango Tart this weekend.